Traditional foods and drink in El Salvador are particularly distinctive among the diverse cuisines of Central America. The culinary traditions are the result of a blend of indigenous and Spanish influences. Salvadoran food can be as familiar as chicken soup, or as exotic as fried palm flowers. Breakfasts in El Salvador typically include an assortment of Salvadoran food, such as eggs scrambled with vegetables (huevos picados), cheese, fried plantains (platanos fritos), mashed beans, and tortillas. Fresh tropical fruits like mango, pineapple, and banana are also a common accompaniment. If you prefer an international option like toast and pancakes they also serve these breakfast items in most restaurants. Because El Salvador has an extensive coastline, seafood is a common ingredient in El Salvador cuisine. Soups (sopas) and stews (caldos) are extremely popular in El Salvador, especially sopa de pata, a mix of ingredients, some unexpected, and typical for Salvadoran cuisine. Pupusas: thick corn tortillas stuffed with cheese, meat, squash, and/or other fillings. They are served with a sour sort of cabbage salad and homemade tomato sauce on top. Empanadas: flour pastries filled with meat, potatoes and/or cheese. In El Salvador, "empanadas" can also refer to a dessert: fried plantains stuffed with sweet cream. The salty ones are usually served with homemade tomato sauce. Tamales: boiled pockets of corn dough, stuffed with meat or sweet corn and served in banana leaves. Each country has a different recipe so a tamale from El Salvador may be different from a tamale in Mexico. Some tamales are cooked wrapped in corn husk but in El Salvador, they cook the tamales in a leaf. Sopa de Pata: a popular soup made from corn, plantains, tripe, and cow's feet. Yuca frita: fried yucca, often served with chicharon (deep-fried pork cracklings). Pacalla: palm flowers breaded in cornmeal, fried and served with tomato sauce. Curtido: a spicy, vinegar-based condiment made from cabbage, carrots, and other veggies. It is much like sauerkraut. Tres Leches Cake (Pastel de Tres Leches): A cake soaked in three kinds of milk, including evaporated milk, sweetened condensed milk, and cream. Pastelitos: pastry turnovers, stuffed with sweets like custard, jam or caramelized fruit. Semita: coffee cake with guava or pineapple jam. The most popular El Salvador beer is Pilsener. Characteristic non-alcoholic beverages in El Salvador include Kolachampan, a sugarcane-flavored soda; tamarind juice; horchata, a sweet herb and spice-based Salvadoran drink; and ensalada ("salad"), a drinkable blend of finely chopped tropical fruits. When it comes to authentic Salvadoran food, El Salvador makes it easy. 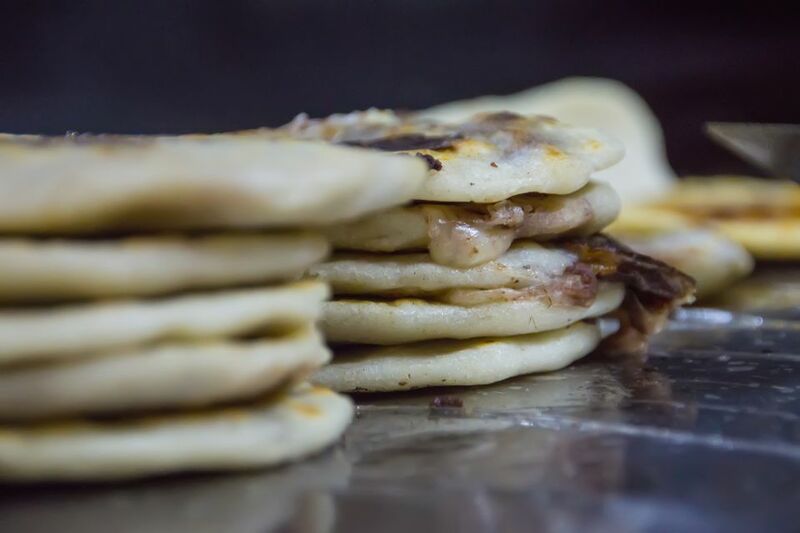 The best place to get a quality El Salvador pupusa? A pupuseria, of course! What about a Pastelito? A pasteleria. Other great (and extremely inexpensive) places to try El Salvador food are street carts and open-air markets. If you're not on a budget, there are plenty of mid-range to upscale restaurants in big cities like San Salvador, and in El Salvador's touristy coastal regions. Salvadoran food is varied, delicious, and fast in its own right. However, U.S. citizens hungry for American fast food can even find it in restaurant franchises like Pizza Hut, Burger King, Wendy's, and Subway in some of El Salvador's largest cities. In turn, pupuserias and other El Salvador cuisine restaurants are cropping up in the U.S.